You may want to trade your after-dinner coffee for tea, especially if you sometimes have digestive issues. Both green tea and many herbal teas may help improve your digestion and limit any adverse digestive effects, such as gas and upset stomach. Check with your doctor before making herbal tea a regular part of your diet, however, as some types of herbal tea can interact with medications or cause other problems. 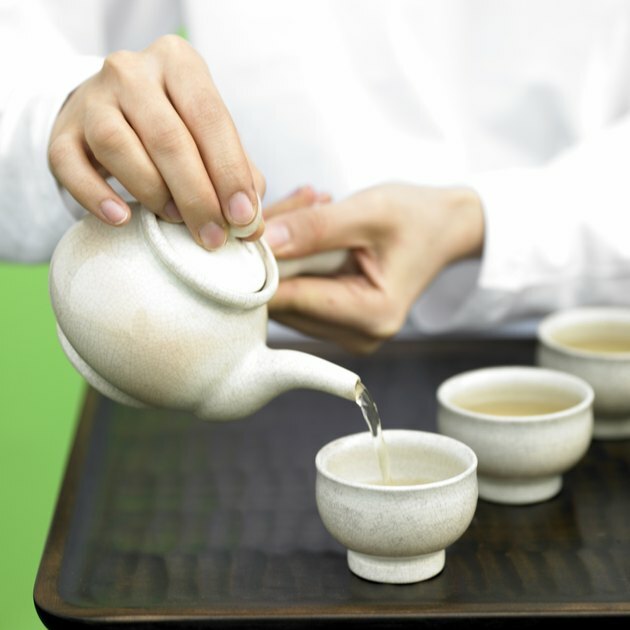 Green tea may be beneficial for digestion because of substances it contains called polyphenols, including catechins. A study published in the "Journal of Agricultural and Food Chemistry" in 2005 found that catechins from green tea increase the activity of pepsin, the digestive enzyme that breaks down proteins in the stomach. Although black tea comes from the same plant, it is more processed than green tea and doesn't have as high a catechin content, so it may not have the same beneficial effect on digestion. Chai tea, which contains a mix of spices including cinnamon, pepper, cardamom and ginger, may also be beneficial for digestion, according to an article on the "Yoga Journal" website. The spices it contains may be responsible for this effect. Cinnamon may help relieve a variety of digestive ailments, such as gas, indigestion, heartburn, stomach cramps and nausea. Ginger may also improve digestion and relieve upset stomach and nausea, notes the University of Maryland Medical Center. A wide variety of herbal teas are also sometimes credited with improving digestion. Peppermint tea may help you digest your food more quickly by improving the flow of bile, which you need for digesting fat, according to the University of Maryland Medical Center. The medical center also notes that dandelion tea may help improve digestion and upset stomach, as well as act as a mild laxative. Chamomile tea is sometimes used to treat gas, indigestion, certain types of constipation and other digestive disturbances, according to MedlinePlus. Mint, fennel, rosemary, juniper and lavender teas may help relieve gas. Other herbal teas that may help with digestion include marshmallow, mullein, European angelica, black cohosh, skullcap and yarrow, according to an article published on Curiosity.com. Not all herbal teas are safe for everyone. Some herbal teas, such as those made with dandelion, chamomile, black cohosh or dried ginger, may not be safe during pregnancy. Peppermint tea may not be a good idea for people with reflux or those taking blood pressure or diabetes medications, and ginger should be avoided by those using blood thinners or blood pressure or diabetes medications. Avoid dandelion tea if you take diuretics, blood thinners or diabetes medications. Curiosity.com: Which Herbs Can Help With Digestion? BabyCenter: Is It Safe to Drink Herbal Tea During Pregnancy?